After listening to your feedback and investigating how people use Jumpshare, we discovered that over 50% of all collections only have a single file inside them. To access a single file, users had to click twice – once on the collection, and once on the file itself! With thousands of single files being uploaded daily, it led to many unnecessary clicks. 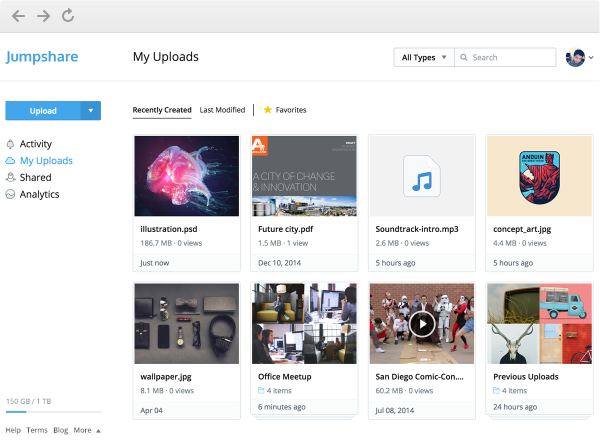 This will not change how you share multiple files – when you upload two or more files from the My Uploads, a new folder will be created automatically. The immediate benefit is you will now see more items per row, which is especially useful when using Jumpshare on smaller displays. You can also now merge, copy, move, and delete items directly from My Uploads, helping you organize your work faster. Lastly, you can mark individual files as favorites for faster access. All this was not possible before with collections. As we prepare to launch our iPhone app, these changes will offer a unified file sharing experience across all platforms. P.S. We’re looking for beta testers for our iPhone app. If you’re interested in participating, please fill out this form. Only the first 100 people will be given early access.